“Geo-spatial mapping technology will enhance the ability of Habersham County emergency services, as well as outside emergency service agencies, to provide mutual aid as they respond to, manage, and coordinate all activities related to a school incident,” said Joey Terrell, Sheriff, Habersham County. As part of its ongoing effort to become the safest school system in Georgia, Habersham County Schools (Habersham) is collaborating with ACG Solutions and The Critical Response Group to implement innovative school security mapping technology. Known as Collaborative Response Graphics® (CRGs®), the technology will support transitioning Habersham’s paper-and texted based emergency operations plans into geo-spatial maps for all of its thirteen schools. These maps are designed to aid first responders in better coordinating a threat response and will provide Habersham County law enforcement a common, digitally displayed operating picture of a building’s structure. Ultimately, the goal is to enhance law enforcement response time, improve command and control, as well as communication with school officials and other first responders during emergencies. 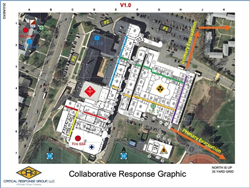 In addition to geo-mapping of school structures, Habersham also is pursuing the development of reunification site maps that allow law enforcement and school administrators to effectively communicate at a pre-planned off-site location, should students and faculty need to be evacuated from campus grounds. CRGs were adapted from a U.S. Special Operations military mapping technique used overseas to communicate during counter-terrorism missions. It is now nationally recognized and adopted in thousands of schools and private companies throughout the United States. CRGs combine a gridded overlay, high resolution imagery and floor plans together into a geospatially accurate map of a building or school. The graphic details encompass room labels, hallway names, external door numbers, and key utility locations. As a result, emergency response teams can instantly visualize their physical location on an actual building plan in real time. According to Adam Bagwell, Safety Team Director, Habersham County School System, the geo-spatial maps are to become an integral part of each schools' safety protocols and safety training practices, and plans call for integration with the county’s existing safety technologies, such as surveillance cameras to further aid staff in quickly and efficiently monitoring and responding to emergency situations. CRGs are a key component of ACG Solutions’ Synchronized Orchestrated Response (SOR™). SOR encompasses surveillance, gunshot and motion detection technologies, access controls and cameras, lock down procedures and more, to increase threat response accuracy and timing through a combination of consultative assessment framework, a unifying platform to integrate disparate technologies, and a state-of-the-art virtual command center. ACG Solutions serves all industries with a complete portfolio of information technology, security and telecommunications solutions for powering the intelligent building™. For more information, please visit http://www.acg-solutions.com. About Critical Response Group, Inc. Formed in 2016 and formerly the Geospatial Intelligence Division of The Rodgers Group, LLC, Critical Response Group is a team of dedicated, experienced and proven professionals from the U.S. Military Special Operations and domestic public safety communities. Members of our team have served as Police Chiefs, SWAT team commanders, Fire Chiefs, Emergency Management Coordinators, Fusion Center Directors and former members of the U.S. Military Special Operations Command who have served on numerous tours in combat. They have a proven record of success operating in environments ranging from the war on terror overseas to man-made and natural disasters here at home.